After being left wanting a little something more with Abandon and Underworld, Awaken really stepped it up and made an impact. It was the culmination of everything that had happened in the previous two novels and when things finally happened, it was wonderful. Pierce has accepted her role as consort to the ruler of the Underworld. She’s made her decisions based on how she felt and what she thought was right for her. She’s finally found a place where she feels at home, like herself, and she’s happy to be there. When something goes horribly wrong, she must take on a new role and fight for the ones she loves. She must rely on the help of her new friends to face this new evil and save those she cares about. The supporting characters are what really make this novel stand out to me. They don’t let Pierce shy away or ignore them. They make sure she knows she can rely on them for help, and they’ll be there for her whenever she needs help, sometimes even before she knows she needs it. They’re a different group of people, I wouldn’t call them normal, but they are there for Pierce and John when they need to be. They provide the real element of the novel. I’m so relieved the storyline went where it did. Most of the little pieces that had been dropped in the first two novels were put in place. There were still a few things that seemed to fall too perfectly into place, and I wish the rules of the Underworld and real world were fleshed out more, but for what it was, the story was great. I had gone into this series thinking it was a modern take on the Persephone and Hades myth, and in a way it was. But it was more about figuring out how to fit into the world and deal with the things thrown your way. Sadly, the relationship between Pierce and John still felt off. The spark just wasn’t there for me. They said they loved each other, but I just didn’t feel like it was really there. There was development, though, and I can see how down the road, there will be a great love between them. They finally trust and respect each other. I still don’t feel like it was love, but I can sense the potential and that was enough for me. 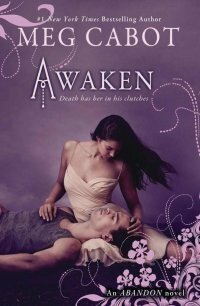 The Abandon series was not what I expected, but Awaken was the best ending to the series I could have imagined. It put nearly all the missing puzzle pieces back together and left me with a satisfied feeling at the end. This part of Pierce and John’s story is over, but it’s easy to imagine their future together. Overall a good series, even if it wasn’t quite what I thought it would be. Thank you to NetGalley and Scholastic Inc. for an advanced copy of the novel in exchange for an honest review. This entry was posted in Contemporary, Something a Little Different, Young (and New) Adult and tagged Fantasy, Meg Cabot, Mythology, Paranormal, Supernatural, Young Adult.